Robin & I leave the girls with the babysitter and head off on our bikes to the race start at Rattlesnake Bar, Folsom Lake. It's so nice being able to ride from our house, and even better being able to ride together. I hurry to the boat ramp. 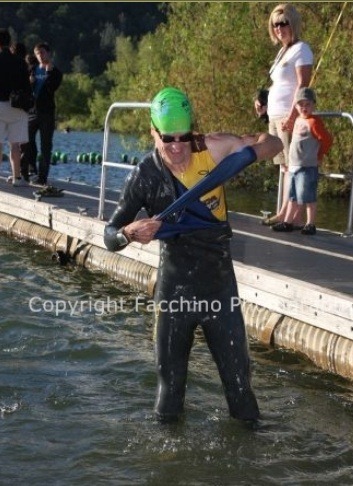 Race Director, Brad Kearns, requires a warm-up swim for each athlete. I'm glad to see the water is high. I swim a little and then see recent Auburn Marathon winner, Jessica Bonner, heading out on the lifeguard paddleboard. She's in charge of swim safety today. She's a talented athlete. If she was racing, she'd surely be up there. I also see Steve. He looks very comfortable in the water and happy as always. This year, our sprint race will start 30min before the 1/2 Ironman. Go! Last weekend's Angels Camp race is a real boost for today. It's about the same distances. I take off fast in the swim, but soon slow way down realizing I can't keep that up. The first swim turn around the tree is always a little hard to negotiate. Then I swim straight for the orange buoy. But the turn is actually at the farther white buoy. This was my only crooked turn, the rest was straighter and more efficient than previous years. I think the sun was higher this time so wasn't as direct in the eyes. Plus, after many years, I know where that 2nd hidden turn buoy is. I see others stopping to sight it. Making the final turn, I realize the course is, yet again, going to be long. I'm glad I'm only doing the sprint and don't have to do it twice like Robin will. Robin's been swimming real good lately so I'm sure she won't mind the longer swim. I push the long straight-away to the boat ramp finish. I may have been a little slower than Angels Camp pace. 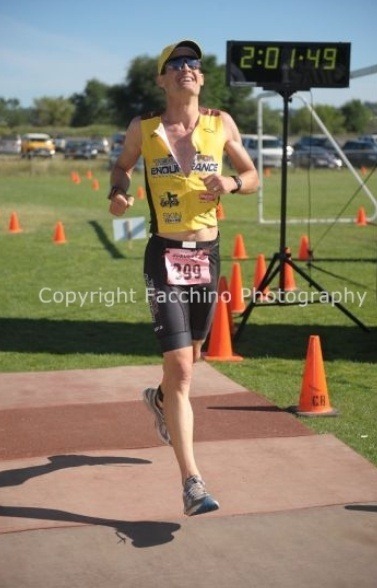 I finish in 20:01, 25th place. My suit comes off fast standing in the water. As I run, Brad announces, "Just throw it to the crowd! Free wetsuit!" No way will I do that. I run to my bike on the uncomfortable rough pavement. I'm off.. without my jacket this year. It's going to be a hot day so I'll be fine. I'm in 16th place after passing 9 people in T1. Quickly I wonder where Dave Campbell is. He's a faster swimmer (and currently in 6 pl on the bike). It's a steep climb. It's going well. I pass a few before the Newcastle Rd split. I see 4 ahead of me but no Dave. Finally, on the last climb to finish Shirland Tract, I see Dave. I really focus on efficient leg work up the hill. I'm right behind him as we hit the descent to Auburn Folsom. I imagine he'll brake.. he is 10 yrs older than me.. but he flies down through the turns. I finally pass him on the flat and fly by Railhead Park where his wife, Francie, is directing traffic. I'm sure she's cheering loud for him seeing us so close together. I have to keep pushing or he'll catch me. Especially on the descents.. he's got a very aero setup. Through familiar bike paths and twisting backroads. I pass one more. We're now on Lincoln Hwy and no one is in sight. I'm in 2nd. I pass Machado's fruitstand where the turn-around was last year. I wonder if I missed it but I see the guy behind me still coming. Must be the full 22mi this year. I'm riding well now as I pass the 1st aid station (for long course athletes only). Then I see the leader coming back. He's got 2mi on me! 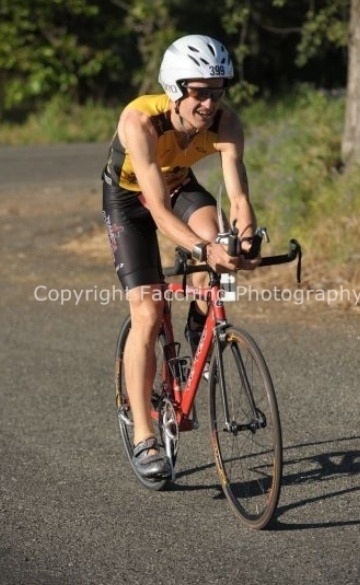 At Placer Hills Rd we turn-around and now I get as aero as possible and go, go, go! I've got to keep the gap and then try to catch him on the run. It's fun flying back through town, in 2nd place, with some folks cheering, and all the intersections monitored. Feels like I'm going faster than I am. I see Karen Nickel heading out with the Duathletes. I hope to see Robin and her smile so I know the swim went ok. On Gum Ln I see her! She smiles and I just know she's going to have a good run. Before I get to T2, I see TeamMate Bill Severi also. 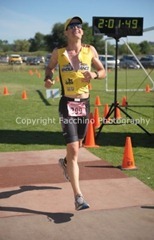 I finish with a 1:12:06 bike in 2nd place. For a second I forget where my stuff is. Then a quick transition and I'm off. Brad yells at me, "Better not go off course, you'll be humiliated". That's for sure, Robin & I run this course all the time. I'm 6-1/2 min behind the leader. Gotta run hard, I never know, he might be a slow runner or get a cramp. It feels good going along the NID ditch. I remember Bill saying "the course is all down hill". It's just about 3mi down and 1mi up. At 1 mi (6:22) I see the aid station I'll be helping at later. I down a full cup and focus on my downhill running. Robin & I were just talking downhill techniques last night. I try to use my calves to quicken my turn-over. I make the right turn onto the dam overlook road. I feel good and make sure to smile at the helpers and spectators. At 2 mi (5:42) I see the leader, Greg Cook. He is running slow. I can't do the math, I just know I have to go fast if there's any chance. I run around Stu's Loop on the tricky trail and it goes well. I remember last year having an injury that made uneven running difficult. It's a fun little loop. Back on the road, I'm getting tired but again Angels Camp was an encouragement.. I didn't die there, I won't die now.. go, go! At 3mi (6:13) I don't see the leader up ahead. It's a mile climb to the finish. I take a gel, a lot of water, and pump my arms. Running the tangents. Hoping I'm getting close. at 4mi (6:51), only a 1/4 to go but I want to be done and the path goes around the park a little. Finally, onto the grass, I hear them talking about the winner, Greg Cook and how he's going to announce 2nd place. I finish in 2:01:50 (27:07 run) and pray. I'm so thankful that God allows me to run and race well again even when I don't always feel good. One of announcers interviews me for a minute. Then I get to see Mike Scarborough & Dave Campbell battling it out across the finish line. And then I bump into my old boss from Humpty Dumpty's Kitchen, Rob Hodges! His wife won the sprint for the females. Thanks, God, for another fun race and I pray Robin has a good day… she hasn't done a race of this distance for 3 years. And that's because of her support of me. I'm so glad to see her ramping up again, thanks to God.